Coming from a Turkish heritage and having a Turkish-sounding name (I don't speak the language), could I be refused entry into a country such as America? I attached a very recent article about a man being refused into the USA even though having the correct paperwork. Although they were never told why they were denied entry, Natasha suspects it was because of her husband’s Turkish name and origin. Ali is British, however, and holds a British passport. ‘I am in utter shock that this has happened,’ she said. ‘We had just got married, we were on our way to our honeymoon as excited as anything, and never expected that we would be deported. 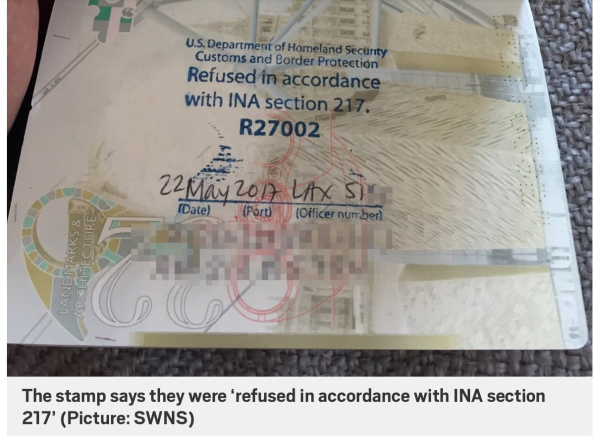 The refusal stamp references INA 217, which in turns means that they may have been denied entry for any of the reasons in Section 212.